Make sure to come back here on Wednesday, July 6 to enter to win your own Go! Baby! Be a follower AND leave one comment telling us what your plans are for the weekend. Blog and/or tweet about this little giveaway and leave a second comment with the link(s). My twitter link is the_blue_chair. The winner will be announced Tuesday, July 5. I hope you all have a great weekend, and a wonderful holiday for those in the US or Canada. I'm not a lemming, but I am a follower. As for my weekend plans, I'll be heading up to Pittsburgh for an ultimate frisbee tournament! I'm a follower Kati and would simply love some of your hexagons!!! :-) My weekend plans include a diamond wedding anniversary party for my grandparents and a trip to the fabric guild, yey! I'm a follower :D For the weekend I'll be spending time with my family, grilling and chilling. And when they aren't here, I'll be quilting! Have a great weekend! I wish i had a go cutter, then my hexagon cutting would go so much faster. I will be glad to be back in town for the fourth! I'm a happy follower and I'd LOVE to make my daughter a Bliss pillow to go with the Bliss quilt I made for her 5th birthday :) Thanks for the giveaway! This weekend, my hubby and I and our 4 kiddos will be heading down to beautiful Carlsbad, CA to visit my folks as it's also my mom's 65th b-day! Just tweeted re your giveaway, I'm @laurajane7789, couldn't find you? Are you on twitter? Hurray! I'm already a follower--love the blog. I am going to sew today and tomorrow. On Sunday we'll be at church & enjoy a pot luck supper on Sunday eve. On Monday we'll have a family picnic. Thanks for your generosity. Let's see . . . I'm a follower . . . and my plans for the weekend: return my younger niece to my sister tonight, and maybe hit a shoe store or two, since my dog ate the ankle strap off my favorite comfy pair of eastland sandals. And tomorrow, visit Ikea and a place that sells acres and acres of lilies. Hoping to take some pics while there. Then I'm coming home to see my husband for a day before he heads back to his job! I'm a follower. I would love to win your hexies. I plan to attend a wedding shower this weekend. I'm a follower! I'm going on a 10-hour car ride tomorrow and then spending the 4th with my family! I'm a follower. We'll do the 4th royally this year, Scout breakfast, parade, gather at the park after parade, go to the mountain for dinner, watch fireworks at night. I'm a new follower and I love your tutorials. Over the long weekend, we stick near home but can watch 5 different firework displays from our deck. i'm a follower. i'll just be at home enjoying my brand new baby boy, no festivities planned. I'm a follower! This weekend I will be walking for miles, as my little one has just discovered the delights of a balance bike. I have discovered the delights of running after him, scared he may fall off! I'm a follower. I would love to win your hexies. And my 5-year old granddaughter is coming up THIS EVENING and I've got her all next week all to myself. I plan on introducing her to sewing/embroidery and we'll see if she and I can bond. Nobody else in the family understands my quilting obsession, so maybe she inherited the genes. Let's hope so! I would be thrilled to win your hexies! I follow and I'm babysitting Saturday night, and BBQing with my family :) and sewing! I am already a follower! This weekend I am continuing my French holiday! Off to the beach at Narbone! Happy 4th of July to you! Thanks for the giveaway! I am a follower and for the weekend, i dont have any specific plans. Im a follower and I plan on being with family and Monday going to my parents annual 4th party. I never wanted to do hexagons till this year -- but there are so many adorable examples of them on the internet now! Your pillow is just adorable! This weekend we are going to a neighborhood barbeque (in less than an hour!) and we will probably go to some yard sales. No fireworks here in Florida because of the many fires! Enjoy your 4th of July weekend! I am planning on going down to Monterey with Hans to hang out with my family! We also have a lot of high school friends that are in town. It should be a really fun weekend! I'm a subscriber. My in-laws will be in town, we'll probably visit the zoo and see the parade on the 4th. I have never tried hexes and would love to give it a go! Thanks for the chance - this is so sweet of you! I blogged about your giveaway at http://salliessampler.blogspot.com/2011/07/friday-finds.html. I am a happy follower! Our plans include a b-day party, a cookout, and a trip to the movie theatre to see Cars 2. I'm a follower. This weekend I'm picking paint colors for our new house--fun, but not holiday related. We have ballet showtime!! We get to watch Twin2 perform on Saturday, and then just taxi service for the 2nd show on Sunday - fixed proud-mummy smile! I'm a follower and would lopve to win your hexagons. My plans for the weekend are picking apples and making apple sauce. Yuuumm! And of course a little sewing too. I'm going to be sewing and entertaining the kids as usual since the hubby is working nights this week. :) Come on scrappy hexagons! awesome giveaway Katie! I"m already a follower. This weekend I'll be dropping of my little sis and her 2 kids off at the airport after having spent a fun filled 2 weeks together! yay! would love to have some hexagons to play with! your pillow turned out great! and yes, i'm a follower! I'm a follower. My plans for the weekend include eating some yummy food & doing as little as possible besides that! And I'd love to make a pillow as cute as the one you made! I'm already a follower, and receive your RSS feed. A family get-together with our four grandchildren (three are between the ages of 7 months and 21 months!) will be a blast! Thanks for the chance to win your hexie-love giveaway. I didn't realize I liked hexagons til I saw your pillow! I would love to make one of these. I am a follower and will be going to a picnic at my daughter's for the 4th. I'll be taking my little girl swimming this weekend and also visiting my brother who celebrates his birthday on 4th July. I follow. :D We're hoping to get some fun kayaking time in on the creeks that wind up to some pretty springs with cool, crystal clear water to play in! I am a follower of your blog. We are horseback riding and just handing out with family! I am a follower and this weekend I am up in Idaho visiting my two brand new nieces! I follow via gfc and I just might mow the lawn this weekend. I'm a follower, and we're going to the Vancouver Canadians baseball game tonight. Fitting, wouldn't you say? i am a follower! this weekend, we are making our way from ontario to nova scotia!! I'm a follower. My daughter and granddaughter are down from the holiday. So lots of fun is in store. I'm a follower! I'll be working, some sewing and going to visit family on Monday. I am following your blog...Well, I will go for fabrics shopping :D Sales in our country's fabrics shop.. Have a happy weekend to you too!!! I am a follower - I am actually working all of this weekend but hope to do a bit of sewing in between. I am a follower - I am going to be taking a couple of grands to the zoo this weekend. We will probably find some place to watch fireworks too. How beautiful! I follow your blog since some months... I love your work! I want to start sewing a dress. The fabric is washed, the pattern ready to go. But still some work to do before I can start! I'm a follower and I'm watching the tennis - specifically the Wimbledon's Mens Final on Sunday!! I'm a follower and I'd love to win some Picnic hexagons! I'm at a craft show this weekend helping my mother in law with her booth. Hope you have a happy fourth! 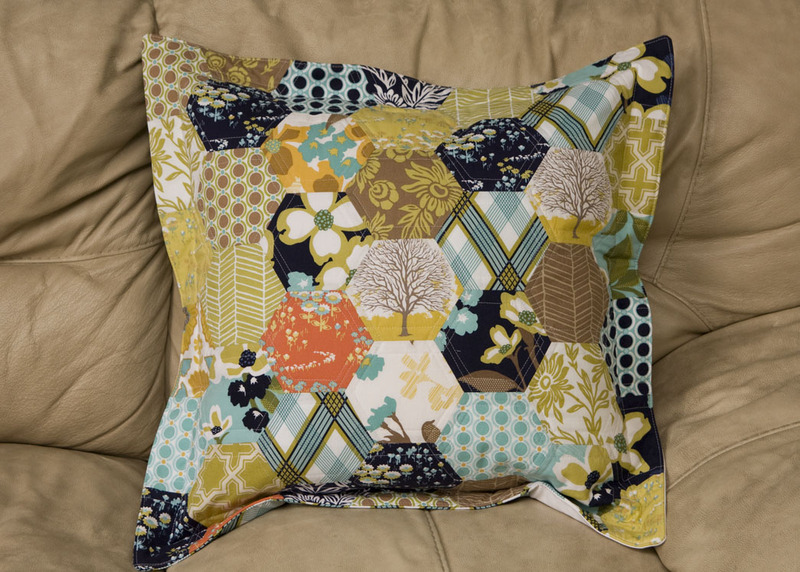 Love the hexies - all the fabrics you mentioned are cool - Bliss, Modern Meadow, Denyse Schmidt! Plans for the weekend and holiday: stay home except for church, watch a Capitol Fourth on tv (I love it), sew, sit on the porch and shell peas, enjoy quiet time with my mother. I'm a follower. I'm a follower! We have 2 BBQ's at friend's houses (Sat and Sun) and then on Monday, I have a craft show!! I retweeted your tweet. I am new to twitter, so not sure how to give you the link other than linking to my twitter account. I follow you. We're home taking care of some chores and sewing, then heading up to a friends' cabin in the mountains for a couple days. I'm one of your followers! This weekend we're going to our town's 4th of July parade, eating some hot dogs and just generally taking it easy. Thanks for the chance to win your lovely hexagons! I'm a follower and I am traveling to Cincinatti for a few days! And my weekend involved the husband coming home after 3 weeks, yay! And we signed the papers on the sale of the house so I'm relaxing and enjoying myself before the hard work of packing begins. I'm a follower and this weekend I will probably be getting our house and yard back in order since I'm just back from a 10 day vacation. If the weather is great, there's lots of outdoor work to be done. If the weather is not great, there's lots of indoor things to be done. Either way, I'll be happy. My plan was to get some sewing done but I ended up at the pool with family having a cookout. Oh well I can always sew a day it rains. I'm a follower. Our weekend plans are to finish some long overdue projects. I am a new follower. My husband and I took a quick 2 day motorcycle trip to Fossil Oregon, yes I cam home with major sunburn!But it was fun!